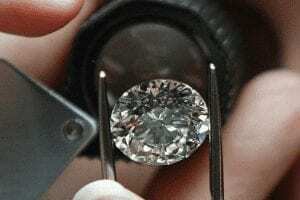 How Do You Reset an Old Diamond? A Comprehensive Answer. Sweet. 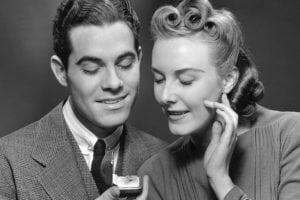 She’s going all BYOD–Bring Your Own Diamond. It’s not quite winning a lottery ticket, but when it comes to your engagement, it’s the closest thing. Congratulations on your good fortune. (Then again… it might not be quite as cheap as you think. As you’ll see below.) For a thorough answer, we’re bringing in a longtime friend of The Plunge, diamond expert Amy Curran, from AdvisorySource.com. This is a charming way to link the generations, and we agree, it increases the meaning of the ring. However, be prepared: it may not lower the cost as much as you expect. The cost in custom-designing and labor required to do this right may not be as low as you think, compared to the price of buying a brand new ring made with new techniques and diamonds cut with modern technology (laser and computers as well as hand-polished finishing). That being said, it can be done. You are right to think that you need to be very careful choosing the right craftsman to make the ring. Why? Even modern-cut diamonds vary somewhat in dimension, from side to side, depth, and even theangles around the tops of the stones. In older cut diamonds, the variations are generally much greater (in times past, cutting was completely by hand, and each piece of diamond crystal was cut to maximize weight retention and beauty — a nice old-fashioned way to do it, but yielded lots of different shapes and sizes.) So… in designing your ring, even if it is a very simple design,the type of setting (for example, prongs will work fine, but channel setting is likely to end up a nightmare) and design elements need to be handled by a really professional craftsman, preferably one who has done a lot of custom work like this. You’ll also delight in the process of actually designing the rings, so that when they are done, you will feel they really express your love for each other perfectly. (Plunge Editor’s note: We are skeptical that you will actually “delight” in the process.) The other thing to keep in mind is that some, if not all, of the diamonds are likely to have experienced some “wear” over the years. 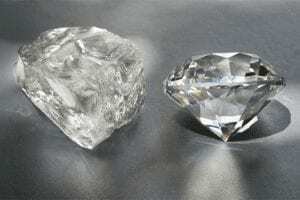 Diamonds, while the hardest substance on earth, do chip (especially if rubbed against other diamonds, or if struck in a particular direction). 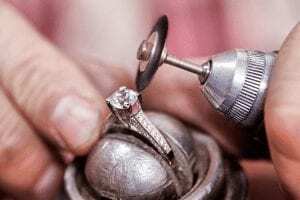 The expert jeweler will not further damage the stones as they are removed from the old ring; a lesser experienced person may chip or break them in taking them out of the ring. Platinum is the best material to use. It is the most precious, the only naturally white metal that will never tarnish or yellow, and if scratched, the metal generally moves “sideways” rather than being lost, as it would be if gold or silver. Platinum is also the metal most likely to stay strong throughout all your lives, and be just as beautiful when you pass the ring along… to YOUR grandchild. Right now, it’s also a really good deal: gold is at all-time record highs, as is silver, while platinum is at a relatively middle-ground price. It is not as easy to work in as gold, so here again you need the talents of a real expert to make the ring. We do not recommend silver. The material costs are indeed low, but since the labor involved to make the ring will be high, with the inherent softness of silver, its inability to securely hold the valuable diamonds, and its natural tarnish over time, you will not be happy for long. For more, check out The Plunge’s Ring Buying Guide.